You are here:Home » Soup » Stone Pot Fish Maw Soup with Snow Fungus, Full Of Collagen! An excellent source of collagen, Fish Maw ( 鱼鳔 ) is commonly used in Chinese cooking due to its high nutritional value. It usually comes in a dried and solid form, and must be soaked to soften before use. 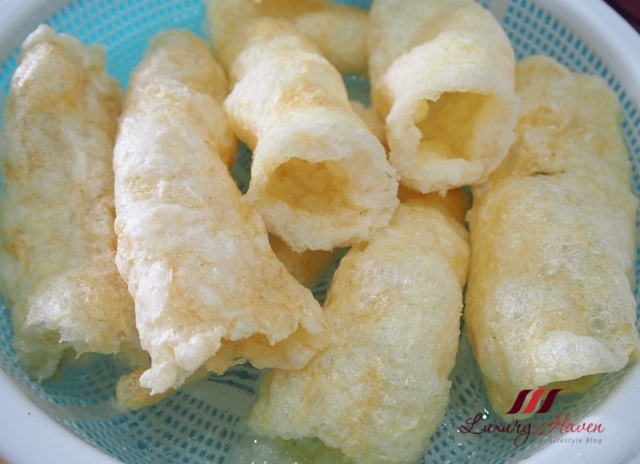 Fish maw is extremely popular during the Chinese New Year with the good ones going at sky-high prices. That being said, prices vary widely depending on the type of fish. Personally, I like to go for the thicker dried fish maws as they give a better mouth-feel. Bird's Nests ( 燕窝 ) are best known to give beautiful skin, but if you can't afford the luxurious bird's nest, consider the Snow Fungus ( 银耳 ) as a more economical alternative. 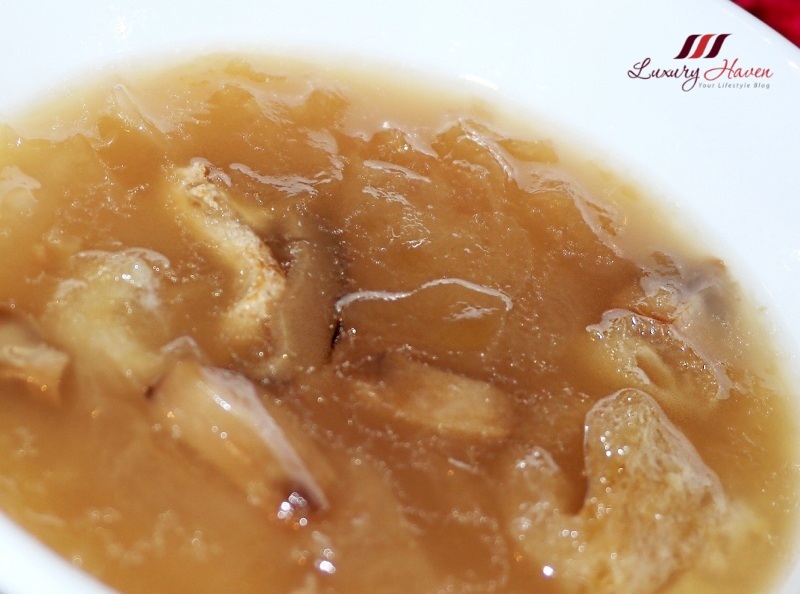 Combining two of the best collagen ingredients - Fish Maw and Snow Fungus, this awesome Chinese beauty soup not only works to improve your health but also your skin complexion. 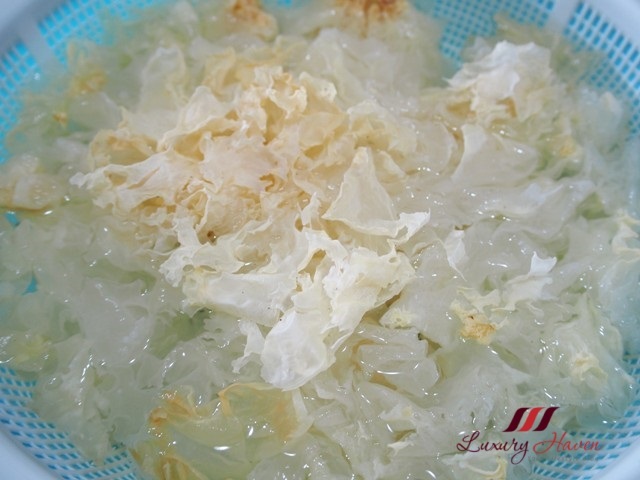 I love adding Snow Fungus to my Fish Maw Soup and using chicken feet for the soup stock as they give a rich gelatin-like texture creating a nice and nutritious base. 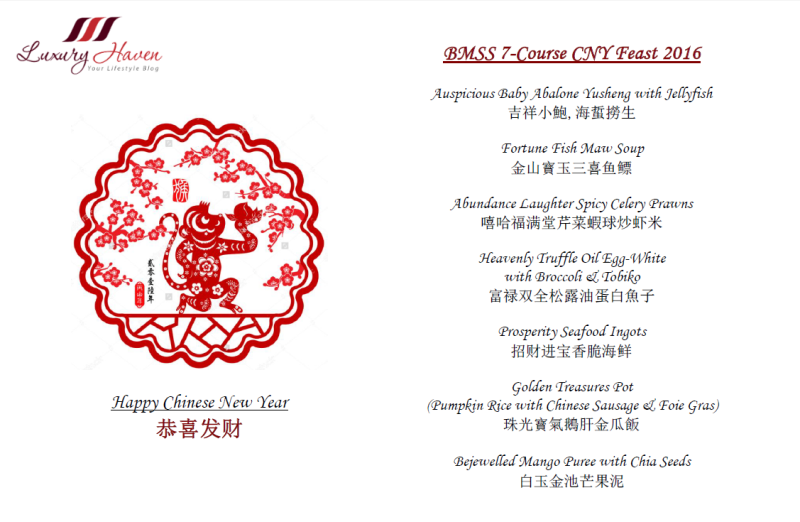 The Stone Pot Fish Maw Soup with Snow Fungus ( 石锅银耳鱼鳔汤 ) was part of the 7-Course CNY Dinner with my old schoolmates and I am so glad that they had enjoyed my Beauty Soup! Soak fish maw in hot water till soft to get rid of the fishy smell and oil. Drain and repeat the step till you have gotten rid of all the oil. Squeeze out excess water, and cut into thick rings. Soak fungus in water till soft. Discard base and cut into smaller pieces. Soak mushrooms in hot water till soft. Cut of stems and dice or slice. Wash the chicken feet and cut off their nails. Blanch with boiling water. Discard and bring the pot of water to boil with the chicken feet, mushrooms and snow fungus. Cover and simmer for about 3 hours. Add fish maw and continue to simmer for another hour. You can continue to cook the soup if you have time for a richer taste. 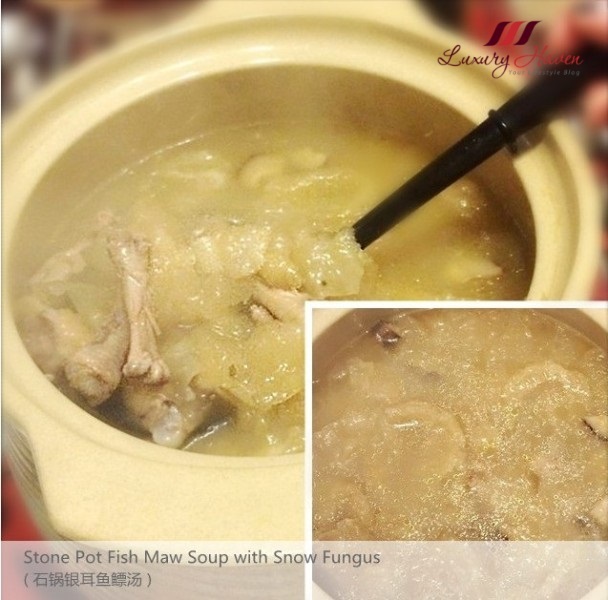 Add seasonings and serve your Stone Pot Fish Maw Soup with Snow Fungus ( 石锅银耳鱼鳔汤 ) piping hot! Are you a fan of Fish Maw too? How do you usually cook yours? 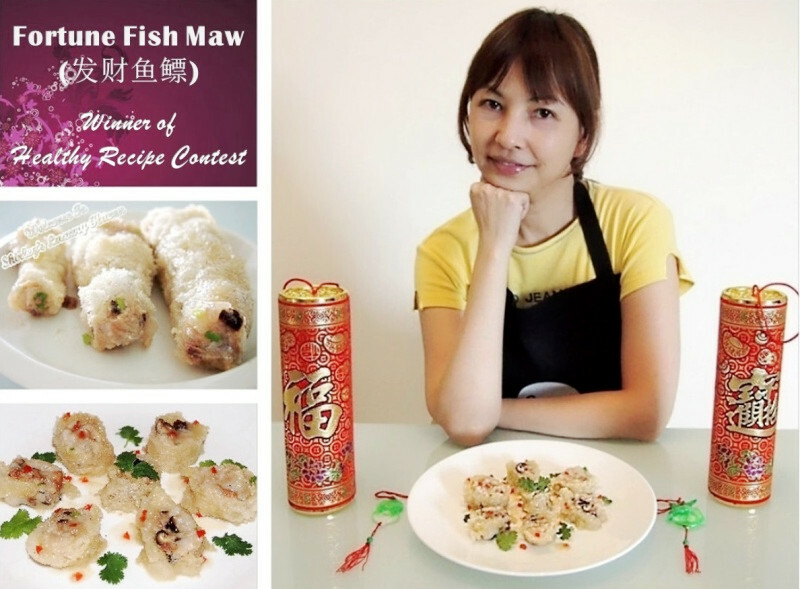 Here's a Fortune Fish Maw ( 发财鱼鳔 ) Recipe that was the Winner of Healthy Recipes Contest 2013 organized by SingHealth! I am a soup lover, this soup definitely suit my taste, beauty soup sounds good to me. I love how full of vitamins this soup is. Wow! I've never heard of this fish before but it sounds like something to add to the diet for sure. This is going to be my favourite!! Fish maw! I like! Collagen! I super like! Hahaha. Yummy! Thanks for the great tips!! I adore soups, too, but have never ever heard of Fish Maw till now :) I have a feeling I'd be a fan. thanks for visiting my blog, i am already following you on g+ :) have a nice day! Bem diferente! Deve ter o gosto bom. I don't think I could eat chicken feet. this soup looks amazing. I'm sure it tastes heavenly. This delicacy should be yummy ! Fish maw plus chicken feet!! I can taste the collagen goodness in your soup from all the way here. Well, nope, I would have never guessed when you asked me what your beauty soup would be made of, lol...That's proably because I have never heard of Fish Maw before. Yummy! I love the rich and a bit sticky taste of this soup. I was told that if you cough often, fish maw is a remedy to that problem. Shirley, what a great way to take care of you skin by eating this delicious soup! I love fish maw but it can be pricey. My family don't take chicken feet too, Gail. We just extract all the nutrients then discard although some foodies swear by the tasty chicken feet. Hahaha! Looks yummy, As always awesome clicks. Ohhh!! I a wobbling here over the deliciousness and skin goodness dish.